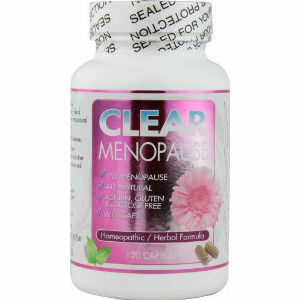 Clear Menopause contains a unique homeopathic formula combined with supportive natural ingredients to provide safe and effective relief from the symptoms associated with menopause. Other Ingredients (Herbal Extracts): Rehmannia, Anemarrhena, Peony, Phellodendron, Cornelian Cherry, Wild Yam, Polygonum Multiflorum, Goji, Moutan, Bupleurum, Red Date, Licorice Root. Note: No information is provided in the product source about actual ingredient amounts contained in the product. $34.99 for a 120 capsule container – a one month supply. The product is available from the product source and also from a dealer network. No information about product guarantees or returns is available in the product source. The vendor does have a contact number and also has a number of product testimonials posted in their source. This product is expensive even though key information about the product including guarantee and return policies is not posted in the product source. Also ingredient amounts have not been included in the product source. For these reasons anyone planning on buying this product may want to review it with a health care professional as a first step. Jackie Horowitz	reviewed Clear Menopause	on September 20th	 and gave it a rating of 2.